At our esteemed 7 Chakras Yoga School, we proffer affordable and soul rejuvenating 7 days Yoga retreat in Rishikesh, India. Simply give a chance to learn and practice Yoga and Meditation in the original place along with some fun based activities in this retreat. This 2 week retreat program will help you to adapt in ashram kind of life, learn yoga, get along with peers, have fun and enjoy holiday activities including local sightseeing, trekking, rafting and so. Moreover, get a chance to bundle up your joy and peace with complimentary massage and an understanding of how to live up a Yogi life and its standards. Exploring the Yogic practice will ultimately let you realize that it is the key to everything for what you might have been waiting and it could help you transform your life into something relevant and meaningful. Relaxation could head one onto the path of spiritual discovery and realisation that will assuredly widely open your mind into a complete new way of thinking. The city Rishikesh, also been referred to as Yoga capital of the world, is a famous tourist destination as well, blessed with beauty, surroundings, peace, harmony, spirituality, and serenity. So, what are you thinking of? 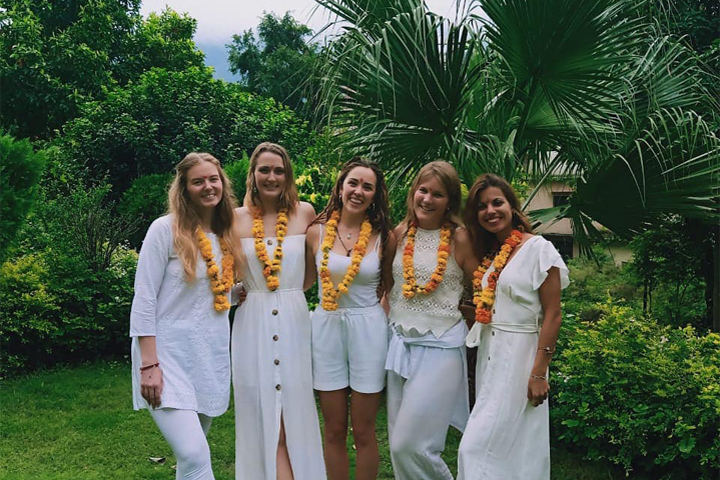 Feel free to book for your 15 days Yoga retreat in advance with 7 Chakras Yoga School, inclusive many things including food, accommodation, yoga learning, fun activities, and sessions with Yoga teachers etc. We can assure that this 7 days Yoga retreat will let you open up new doors of your life, so register for this and check out how it could benefit you. The daily schedule could change and covers tea, Yogic cleansing, Mantra Chanting and Pranayama, Yoga Asana, breakfast, Yoga Philosophy and anatomy session, lunch, Yoga Nidra, Asanas, meditation, dinner, lights out. Do contact us for more details.